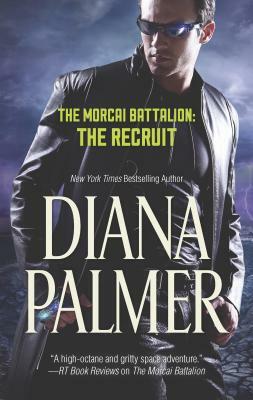 Diana Palmer's second installment in her thrilling space epic is a vast panorama of far-flung civilizations, interplanetary conflict and galaxy-spanning passion... THE MORCAI BATTALION: THE RECRUIT A prophecy foretold: Three years after the unprovoked attack on a peaceful colony, the war between the Rojok dynasty and the Tri-Galaxy Fleet rages on. Born of that war is the Morcai Battalion, a fleet comprised of Centaurians and humans--the first collaboration of its kind and a step toward an intergalactic alliance. But the fragile union is tested as their courageous commander in chief, Dtimun, is faced with the temptation of the forbidden--and human--Dr. Madeline Ruszel. A combat surgeon, Ruszel is aware of the danger of inciting a Centaurian's interest, even if he is the most intriguing of men. Besides putting their mission at risk, personal relations between their kinds are still outlawed. But a prophecy that touches on both their lives and the future of all alien nations hints that a greater unity may be theirs for the taking...if they, and their crew, survive in the battle for peace.